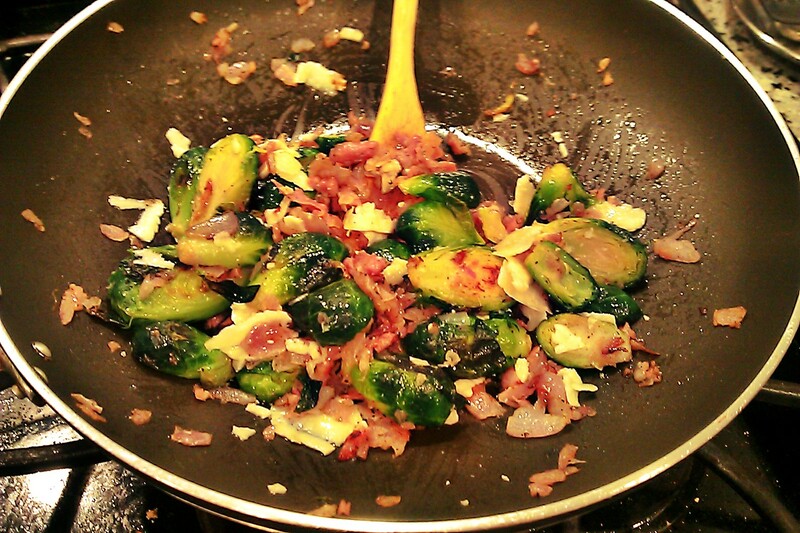 Simple but delicious Brussels sprouts with sauteed prosciutto and onion, black pepper and grated Pecorino Romano cheese. Recipe serves 2 or 3. Steam Brussels sprouts for 1 to 2 minutes. Or blanch them in boiling water for 1 minute. Remove Brussels sprouts from steamer and place on baking sheet. Bake on center rack for 10 minutes. In a large skillet heat oil to medium-high. Add onions and saute until it just begins to brown 5 to 7 minutes. Add prosciutto and stir fry for 2 minutes. Add Brussels sprouts, pepper and stir fry for 2 to 3 minutes. Mix in Pecorino cheese for about 30 seconds, remove from heat and serve. This recipe is AMAZING! I have just recently discovered brussels sprouts (I know) and cannot find many ways to cook them, but this gives them a totally different taste! Thanks for the idea! Great blog. Thanks Nicole! Speaking of Brussels sprouts I chopped some up last night and mixed it with Sicilian chicken sausage, mushrooms, mozzarella and a bit of olive oil and topped them on pizza dough to make a home-made pizza. Thank you for the compliment and I’m glad you discovered the Brussels sprout!